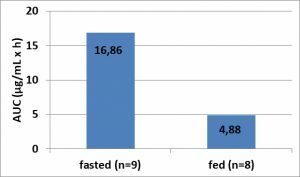 Study Design: Dogs received D-penicillamine (12.5 mg/kg PO) fasted and with food in a randomized, crossover design to test the effect if food on the bioavailability. Results: Coadministration of D-penicillamine with food significantly decreases plasma drug concentration. There were significant reductions in relative bioavailability and Cmax in fed dogs. Conclusions: Decreased bioavailability can result in decreased copper chelation efficacy. Therefore administration of D-penicillamine with food cannot be categorically recommended.